Browse a selection of our completed commercial projects to experience the diversity, innovation and creativity necessary to complete these truly individual projects. 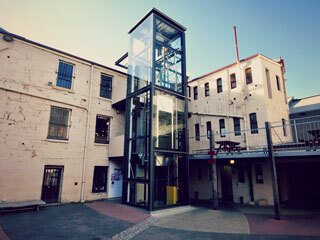 Constrained by the heritage listing of the existing building and the exterior facade being sandstone, this three storey lift required the design of a completely independent self-supporting shaft, which was glazed and combined with a covered walkway. The works were undertaken in the middle of winter, which meant managing and coordinating the installation of electrical items (most importantly the motor) in an effectively outdoor exposed environment prior to the completion of the shaft roof. 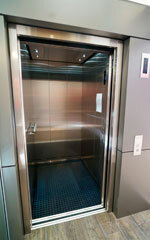 The lift is free-standing with glass on all four sides, which enhances the user experience. The project also included a trolley barrier to protect the rear glass wall. This project featured the removal of the 1950s era goods lift (complete with bi-parting doors) and the installation of a new 15-passenger lift carriage. In addition the range was extended from four to five floors of the sandstone bond store building. Existing openings were enlarged, and a solution had to be engineered to re-support bond beams to facilitate the extra floor. This required cutting out and removing a concrete slab five storeys above the ground! The lift is MRL (machine room-less) with the controller located within the shaft. 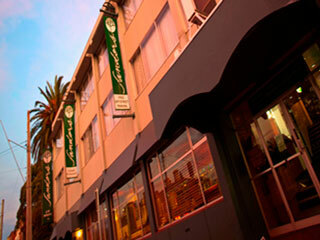 Works were completed whilst the building was in constant use as an art gallery, gym and business offices. 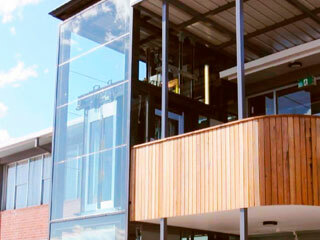 Working in conjunction with architect Xavier Wakefield, this variable frequency drive lift is a two-stop, wire-roped glass unit installed in a glass shaft whilst the medical centre remained open for business. We provided flexible working solutions to assist in keeping the centre open, thereby avoiding the inconvenience of relocation during construction and installation. A very unique project, this four-stop lift has glass on all six sides. Owner John Kelly wanted to achieve something a little bit special with the revitalising of the State Cinema, which now offers unique dining and viewing experiences. His approach was carried through to the installation of the lift, with doors hung in glass surrounds on customised brackets and a completely glass shaft. 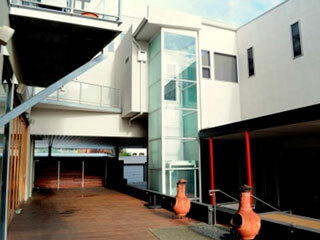 The top floor is the entrance to a roof-top experience of film and open stargazing. An Australian first was recently completed by Access Solutions - a lift with doors on three of its four sides was supplied and installed to Montrose Bay High School in Hobart, with all the technical details engineered by Access Solutions. This involved customisation of mechanical parts, specialist input on design, and registering the lift by completing a comprehensive independent design analysis. The walls and doors are all glass, which not only provides an enhanced visual experience for passengers, but also enables safer supervision for the courtyard location. The architect was Drew Edwards from Blythe Yueng (assisted by Patrick Mann) and the project was managed by Julian Proud from Hansen Yuncken. 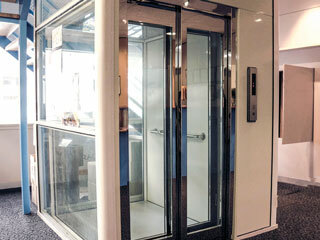 Installed in 2009, this two-stop disabled access lift has auto doors and a glass shaft. Access Solutions undertook the total design and construction process, including moulding a staircase around the shaft, adjusting the internal walls with security access and all the electrical upgrades required. The project involved removing a steel beam that was made in England and brought over on the early ships. 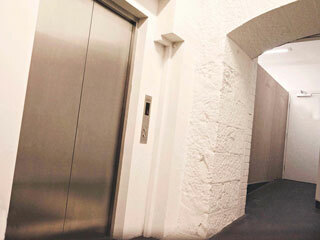 A complete design and construction project, including building works, to install a three-storey lift inside the entrance foyer of an operational hotel. A 90-degree corner car was used to overcome access issues within the entrance area and offer access upstairs to the accommodation units. Works included underpinning the existing foundations, cutting through 4 slabs over four levels and craning structural steel through the roof. A temporary floor-to-ceiling barricade assisted in noise and dust reduction, while specialist extraction systems were used to redirect exhaust fumes from excavators and other equipment brought inside. 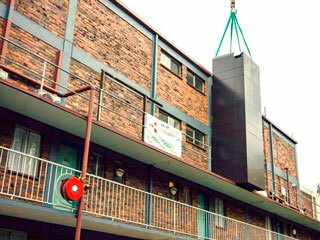 The lift itself is a simple hydraulic unit roped in a 2:1 ratio using a single stage ram. 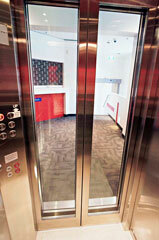 Our client Barry Monk required a lift installed in the foyer of his building. The build aspect became very complicated because the whole mains electrical supply was located in the exact same place the lift pit was required, and a 50-pair phone line happened to be there as well. Both were relocated, and new smoke detectors installed to the shaft to tie in with the existing system. Rock blasting was required to obtain the pit depth. This took place while the client was overseas and a diary with pictorial displays was supplied to keep the client informed. The lift itself is an 8-person corner car hydraulic unit. Access Solutions also supplied and installed the shopfront featuring Kaba automatic doors. 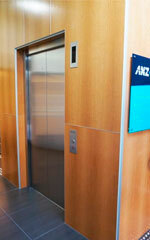 These lifts for ANZ and Westpac were both installed inside an incredible twelve weeks from order. 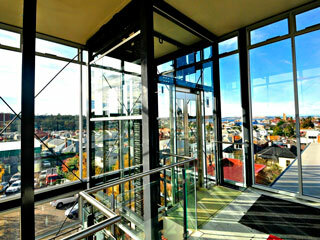 Both are eight-passenger MRL (machine room-less) units in the heart of Hobart CBD. Access Solutions provided the steel towers for the shafts in both locations, one being built offsite and craned in, the other being prefabricated and assembled on site. 24/7 installation teams achieved an amazing result in a timeframe that no other company was prepared to undertake. A challenging project involving design and off-site construction of a five-level lift, ready to be craned into the fifth floor from the street frontage. Installation involved extensive pre-emptive works, relocation of services and project coordination to reduce exposed height safety risks and operational disruptions. The tower was clad in Alucobond, the existing roof was modified to suit and the car fit out was 100% customised. The plant room was covered with a vinyl print which replicated the existing brickwork. Fully automated push-button fire-rated swing doors are the feature here, with the lift being installed during occupancy. Access Solutions supplied and installed this disabled access lift to the TRC Apartments, featuring a fully exposed glass shaft and roof. This project involved the supply of a DDA compliant 2000kg goods lift - complete with onsite fabrication of its steel shaft, extra high doors for easy freight movement and a low level security interface. A very shallow pit was required due to ground water considerations and Access Solutions was able to provide on-site construction advice.